Fashion mistakes are like measles, the earlier in life the better. Unfortunately for me, I didn't make enough fashion mistakes while growing up, so I ended up spending my first 3 years after university making one fashion mistake after another. After the final interview for my first job, the interviewer called me back and gave me fashion advice. The only consolation was that he gave me the impression that I would be hired. I became more conscious of the way I dress and look. But I was getting so many incorrect fashion advice that I ended up learning what not to do only after being embarrassed for doing them. Read the statement in the image above? 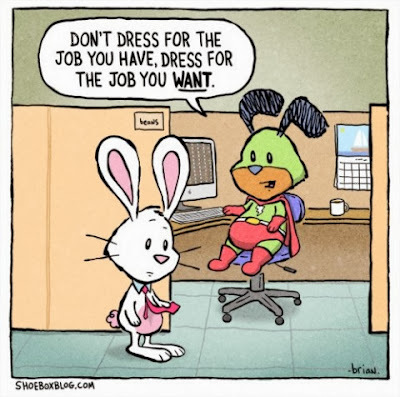 That's one of my former senior colleague's favorite -- Dress for the job you want and not the one you have. And it's has become a sort of a life mantra for me. 1. Always match the color of your belt with that of your shoe. 2. Match the color of your socks with that of your trousers. It's not a must, but you can never go wrong doing this. 3. If you want to wear a tie, then wear a jacket (a blazer or suit). 4. Always get clothes that are your exact fit. Even if it means asking your relatives to quit sending you clothes. In fashion, fit ranks way higher than style and quality. People that matter do not care if your shirt is N50,000 once it does not look like it's yours. 5. Close your eyes and get a very high quality grey or navy blue suit. Avoid suits that are made of polyester, they are a big no no, it will always make you look odd and cheap at formal events. Get suits made of wool. Except you work in a bank and need a suit to wear to work every day, do not get your suits from Oshodi or Marina. 6. If you wear a chain wristwatch, make sure it's fitting and not almost falling off your hand. It's a wristwatch and not a knuckle-watch. 7. If you don't want to create unintended unimpressive impressions, do not wear a french cuffed shirt without wearing a jacket. 8. Don't use your suit's jacket as a blazer. They are not the same. 9. Don't hang car keys, ID card tags or phones on your belt. It's not what a belt is meant for, and it makes you look like an office assistant or official driver. 10. If you decide to wear a pocket square (which is a very good thing), don't wear exact color and pattern as your tie. And you can never go wrong with a white pocket square. 11. Have at least a black and a brown belt. And matching shoes too. 12. Always choose quality over quantity. Quality makes you look smart and saves you money in the long run; it could even earn you a promotion. And those are my 12 commandments of fashion. If you're on a budget lifestyle like me, here is a great trick. After doing a lot of observation and costly experiments, I found out that you could get a trouser from Oshodi and no one would be able to tell it apart from a trouser from Twice As Nice store. You could also buy a great N6,000 shoe. But you can never buy a shirt at Oshodi that will look like an original Hawes & Curtis or Thomas Pink. I have a N11,750 Perry Ellis Portfolio trousers, and I'm the only one that can tell it different than the N1,800 ones from Oshodi. I have seen N45,000 shoes that look exactly like the N6,000 ones I bought at Oshodi. But my H & C shirts, my TM Milan and John Francombs have no look alike in Oshodi, Ikeja and Marina. They give a look and cut that is far superior to any you can buy at Oshodi or Marina, and even make every other thing you wear look expensive. Finally, shirts are the first piece of clothing people notice on us. Buying a very high quality and fitting shirt is a very good investment. I've never heard people saying, "That's a nice trousers!" but I can't count the number of times I've heard, "That's a nice shirt!" Know any fashion rule I'm missing? Please share.